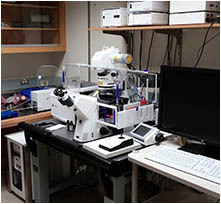 Dual side illumination light sheet fluorescence microscope Dual side illumination light sheet fluorescence microscope (LSFM) also called Single/Selective Plane Imaging Microscope (SPIM) with incubation, 6 laser lines and Dual PCO Detection Modules. 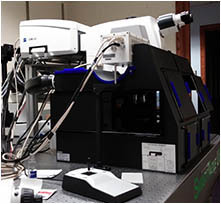 This microscope is optimized for the imaging of live samples with subcellular resolution since it uses 20x or 40x objectives with an NA of 1.0. The Zeiss can also do CLARITY at 5x magnification though resolution is less at this magnification. To help eliminate shadowing and provide even illumination, this system can generate two light sheets coming from opposite sides. 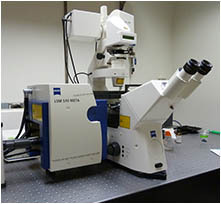 Unlike the first LSFMs which relied on a static light sheet created with stationary mechano-optics, the Zeiss uses a scanned laser beam to generate the light sheet (known as digital scanned laser light sheet fluorescence microscopy, DSLM). 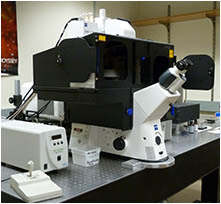 DSLM has at least 3 advantages over standard light sheet microscopy (Keller, P. J., and H.-U. Dodt, 2012. Current Opinion in Neurobiology 22: 138-143): (1) Each line of the scanned light sheet is illuminated equally, facilitating quantification. 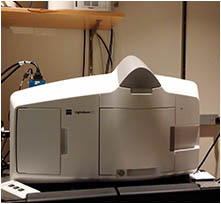 (2) No aperture is required to form the light sheet which helps minimize optical aberrations. (3) Since the entire laser power is focused into a line, illumination efficiency is 95% instead of ~3%. 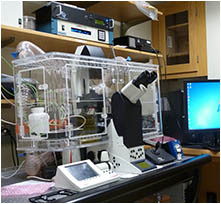 Samples are typically mounted in low melting point agar inside a capillary. Location: Beckman Institute Basement Room B101C. 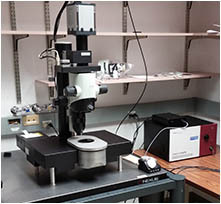 • This LSFM is high speed while being gentle on your sample. 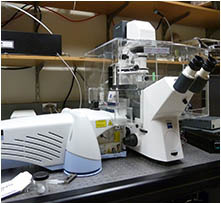 • Good for live imaging of embryos. • Motorized X,Y, Z stage with 360° rotation. 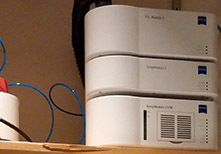 • The sample chamber can regulate the temperature, CO2 and Oxygen for live imaging. • Temperature from 10 to 41+ degrees C so good for cooling and heating. Technical Specifications: Camera: Two PCO B&W cameras. Illumination: 6 Laser lines: 405nm (50mW), 445nm (25mW), 488nm (50mW), 515nm (20mW), 561nm (50mW), 638nm (75mW). OS/Software: Windows 7 Ultimate, Zen 2012 with LSFM Module. Second workstation with Arivis software, Arivis Vision 4D for Visualization and Analysis (32 TB of disc space).